Situated near Sunderland, the round barrow at Hasting Hill was excavated by eminent local archaeologist C T Trechmann in 1911. A profuse amount of human remains were found in the barrow, along with a large quantity of pottery. The range of pottery was diverse, and included numerous Food Vessels, a miniature vessel or incense cup and a Beaker. 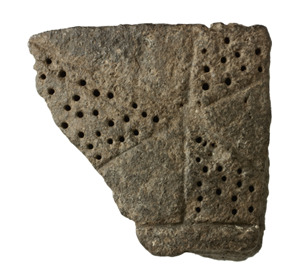 The miniature vessel was decorated with three incised triangles which met at their points, and was decorated with impressed dots. This was found with the jumbled remains of several people. Towards the edge of the burial mound an inverted Food Vessel was found inverted over cremated human remains. 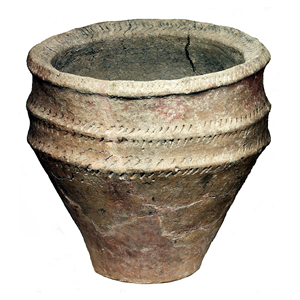 This Food Vessel was comparatively simple compared to some – bipartite with a cavetto zone and diagonal stabs on the mouldings. The rim is decorated with a herringbone stab pattern. The Beaker was also very simply made, with decoration limited to simple oblique indentations on the body. This demonstrates the diversity within the pottery group, with very simple vessels ranging to very complex ones. Every pot was made by an individual who made choices about what they wanted the final pot to look like, and this means that no two pots are the same. The pottery is held at Sunderland Museum and Winter Gardens; several of the pots are currently on display.